except that i wouldn’t necessarily use the world lonely. i’m pretty sure the article must have been written by an extrovert. 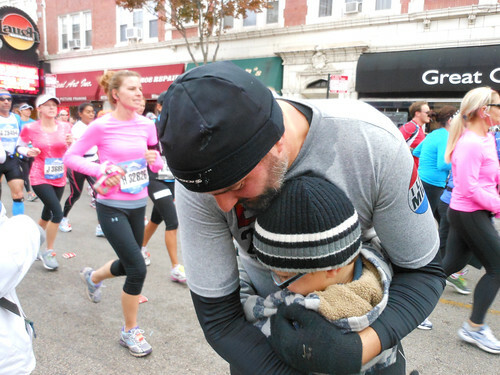 in fact, i call training for a marathon and running alone, mostly at night – even in blizzards – energizing. 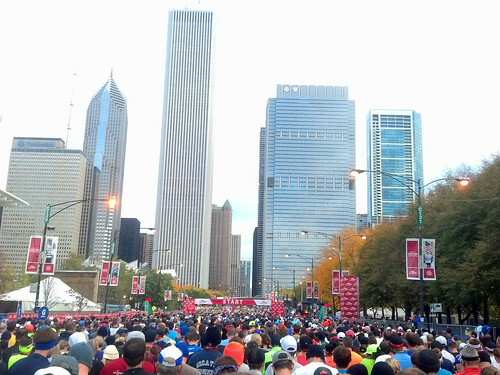 running in the 2012 chicago marathon! after three weeks of tapering down running and getting my personalized running shirt, the start of the chicago marathon had finally arrived. it was chilly in grant park, with temps hovering around 37°F. it was cold enough that the day before i went to a thrift store in wicker park and picked up some stylish “disposable” cold weather sweats that i could ditch after warming up. i can’t believe i didn’t get a picture of me in what looked like a 1985 “sports illustrated” branded warming jacket. and, wow, was there a lot of people. i think the official count was something like 45,000 runners which is a. lot. of. people. i forgot what it was like to run with that many people and, to be honest, it started messing with head about 20 miles into the race! here’s the view after the start. there are so many people that it took about 10 or 15 minutes of slowly ambling along before you even get to the starting line. this was also the first year officials created two separate starting times. the first group started at 7 am. i was in the second group that started at 8 am. i’m not sure but this might have been done, in part, to cut down on the time it takes to just get started. if i recall correctly, when i ran 9 years ago it took 45 minutes just to cross the starting line, which is a long time to be standing around on a chilly morning! people were tossing their “disposable” clothes while slowly making their way to the start so it can be a little tricky to not trip over piles of clothes before you even get going. i had the best intentions of taking a bunch of photos along the way but my droid phone completely drained its battery after just 7 miles while running runkeeper after switching to 4G. so it was extra nice that kris remembered to bring her camera and was able to catch some nice shots, like this one just moments after i spotted them at about 7.5 miles mark. odin was happy to see me, but i think he was also happy to have me get moving so he can jump on the “L” with kris in their own race to meet me at the next stop. they also met up with me at about the 17 mile marker. none of us had mobile phones, so it was no small miracle that we were able to catch each other along the route. i knew the general marker that we were going to try and meet up, but the entire route was packed with spectators so it was really tough to pick them out even though they were waving signs and ringing cow bells. at this point, i’m still feeling pretty good. i maintained about a 4:20 actual running pace through the first 16 miles and was running slower than i could have run because of a nagging, knotty feeling i had in my right hamstring. it wasn’t anything painful but it had been noticeable through my entire three weeks of tapering and was the kind of thing that might turn out to be nothing or might send me hobbling at the 20 mile mark. you’ll also note that it’s still cold enough after 3 hours of running that i still have my thrift store running pants on. i think it might have been 43F which can usually be shorts weather but the breeze was mighty brisk. no joke, it’s a great motivator and totally not as narcissistic as it might sound. 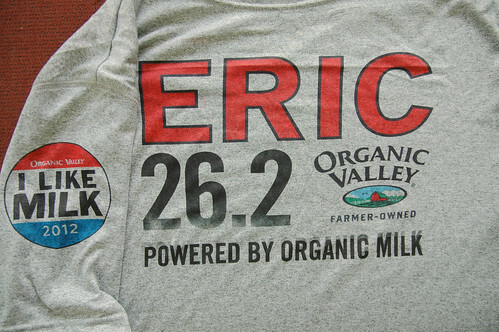 it was also fun to hear people yell my name and then shout “i love organic valley!” after i ran by. there was even a guy who wanted to talk about how much he loved ov as we were running along. incidentally, the shirt was made by atayne and is made from 100% recycled polyester produced from post-consumer plastic bottles. 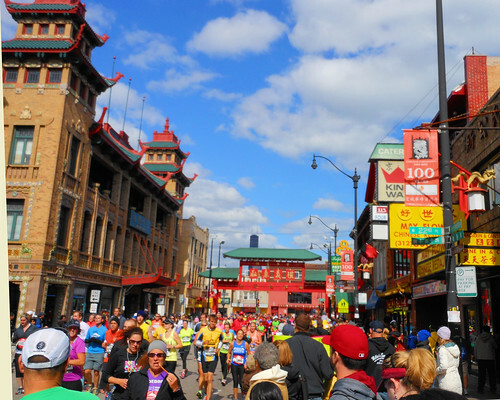 one of the many great things about running in the chicago marathon is going through all the awesome areas that make up chicago like chinatown which is on the route around miles 19-21. tons of people in all the neighborhoods line the streets and highlight the diversity in chicago. i wish i could have taken more pictures of the bands playing and the characters along the way, but alas my phone was dead. and here i am at about mile 21. not sure what’s going on here. getting a little loopy. it was awesome running into kris and odin again because i was fighting The Bad Thoughts from mile 16 to 21. i think everyone gets them and fighting through them is all part of The Marathon Experience. after 20 miles your body is really doing all it can to tell you that it really doesn’t want to keep going. but you just have to fight through it and keep putting one foot in front of the other. stretching it out before heading off for the last 6 miles. AND SHUT YOUR PIE HOLE, THAT’S NOT A BALD SPOT! I GOT A SHORT HAIR CUT AND MY RUNNING CAP SMOOSHED MY HAIR ALL WEIRD! ah, all the hard work and, at last, a photo of me running triumphantly towards the finish line while my wife and son cheer me on from the stands! except! kris! missed! the! shot! 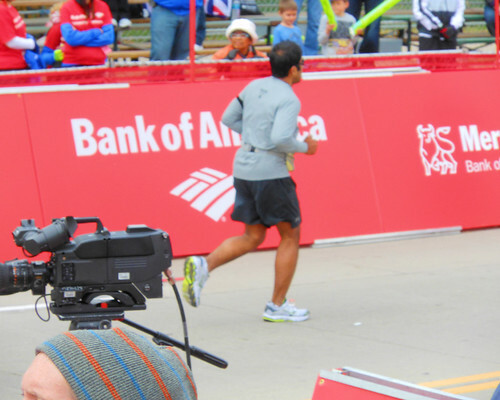 frantically, kris tried to get another shot of me running towards the finish and instead got a shot of a guy who sort-of looks like me. even though action sports photography might not be her forte, she’s a keeper. i made it! 26.2 miles! whooohooooooooooooooo! all things considered it was a great run. my “chip time” was almost exactly 5 hours from start to finish, but my actual running time after factoring in stops to see kris and odin and two veeeerrrryyyy long waits in bathroom lines was probably somewhere between 4:30-4:40 which is just about what i wanted to run and even a little bit better considering i was running slower than i could for most of the marathon to make sure i didn’t gimp across the finish line with a knotty hamstring ( which ended up clearing up magically at about 20 miles. had i known my hamstring wasn’t going to give me any trouble i probably could have ran 4:20, but i’m totally happy with my finishing time given the fact that i was able to sprint ( or as close as i can come to sprinting after running a marathon ) the last 1.5 miles and had plenty of gas left in the tank. and i think there will be a next time. or at least another marathon, even if it’s not the chicago marathon. to be honest, although i had a great time overall, running with 45,000 other people can be a draining mentally. i remember it being invigorating 9 years ago, but this time around i was surprised at just how much mental energy it takes to run with that many people in feels like “shoulder to shoulder” conditions the entire time. there were plenty of times when i could have potentially ran faster but it felt like it was going to take too much energy to try and negotiate a path between all the runners. maybe my next marathon will be a little smaller. 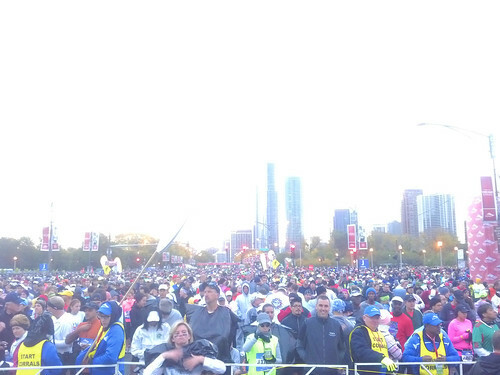 then again, 45,000 runners really brings out the crowds which is energizing and fun. so who knows. but that’s a minor point. the important point is that i set a goal of losing 70 pounds and getting in shape for a marathon and i did it. 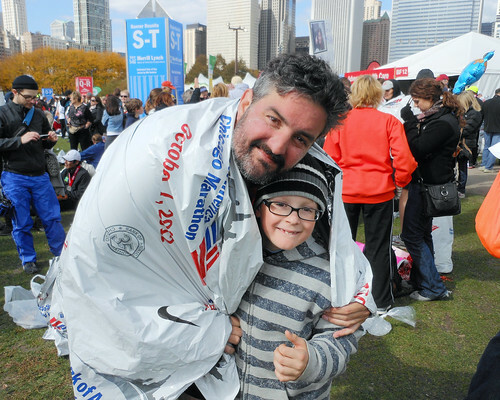 almost 8 months after deciding to sign up for the chicago marathon, the big day is nearly here! 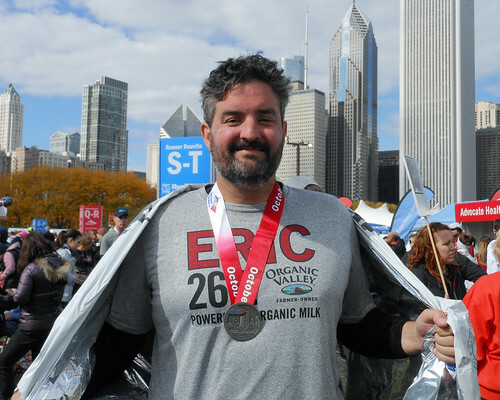 it’s hard to believe it’s been 9 years since i last ran the streets of chicago and almost harder to believe i’ve lost nearly 70 pounds over the past year to get back into marathon shape ( note to self – don’t let that happen again! ). 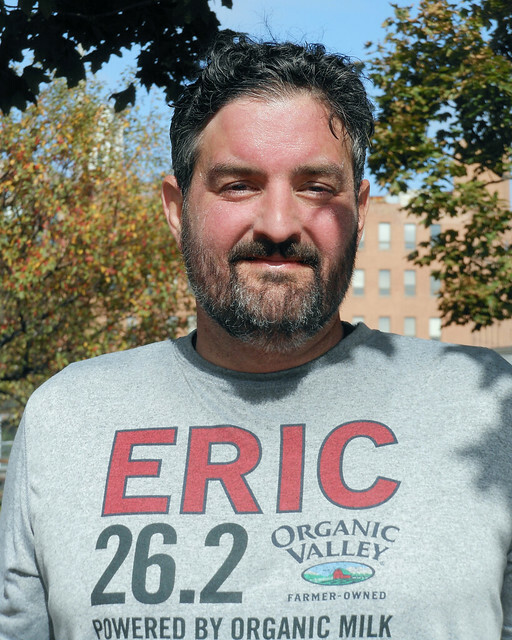 when training for marathons the last time around, a veteran runner told me to put my name on my shirt so people could give a personalized shout-out all along the route. it really gives an amazing energy boost, especially in the last few miles. i already wrote a bit about what time i thought i can run in the “20 miles! and the brutal math of Being A Clydesdale”. i still think i can theoretically run a 4 hour pace, although 4:15-4:30 is probably more realistic this time around. 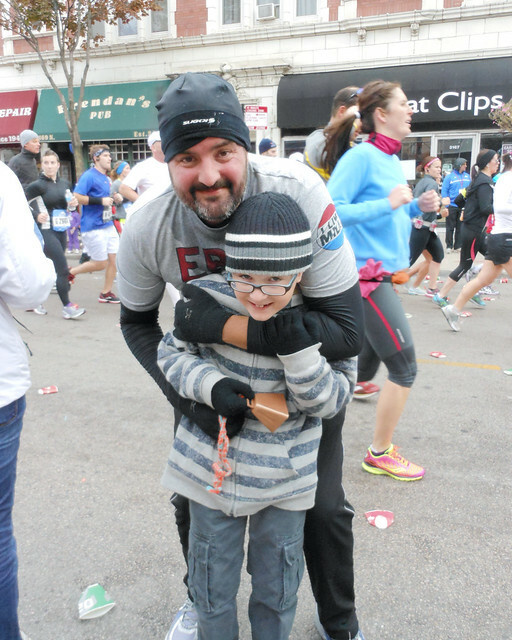 but to be honest, i’m just going to have fun, enjoy the crowds along the route and take some extra time to stop a few times along the way to chat with kris and odin who will be there to watch me run, so who knows what my actual start to finish time will be. 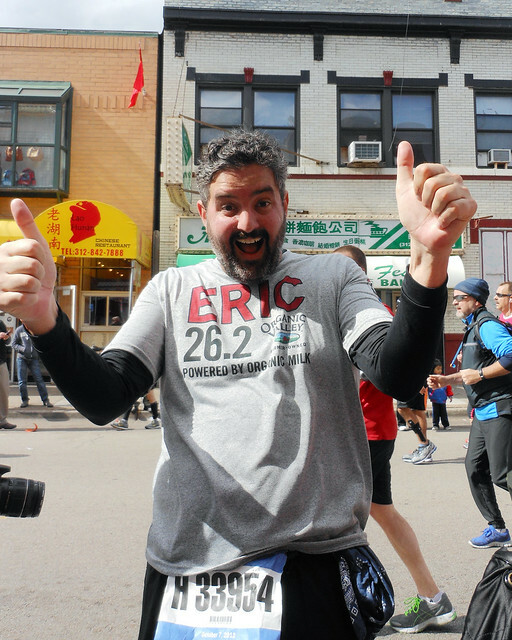 for my first marathon in 9 years, my real goal has already been accomplished – to get back into shape and be able to make to the start line without injuring myself. now i just want to enjoy the day. 45 degrees F. time to bust out the fashionable winter running gear. finally running weather befitting a snowdeal! after running in brutal heat and humidity all. summer. long. i am absolutely, positively ready for running in colder weather and much, much prefer 32F-60F running over 70F-90F. and, hey, what’s not to love about running around in veeeeery fashionable cold weather stretch pants? 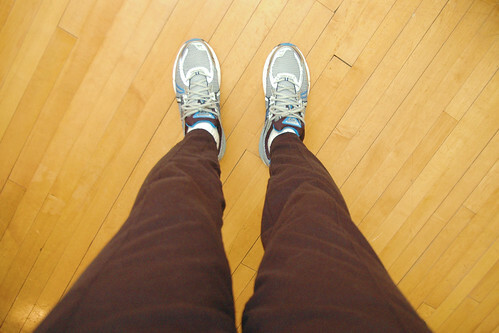 i’ve had these hind running pants forever and really like them. they do a fantastic job keeping me warm even in the 10-30F range. but this comment leads me to believe the well-known reputation for quality has disappeared in recent years. anyone have any recommendations for reasonably priced cold weather pants? tapering down for the chicago marathon which, unbelievably is only two weeks away! a mere 9 mile run in coold weather today after weeks of long run in the heat felt great even with 20mph wind gusts. i can only hope it’s this cool on race day. 20 miles! and the brutal math of Being A Clydesdale. whoohoo! i ran 20 miles for my long run this weekend in preparation for the chicago marathon which is, unbelievably, only 4 weeks away! i was “only” going to run 18 miles for my LSD ( long slow distance ) run this week, but things were going so well i decided i had enough gas in the tank for 2 more miles. i think i’ll probably run another 20 next week, maybe a bit more if i’m feeling good and then it’s time to taper down for the marathon. since it’s getting close to race time, people are asking more often what time i think i’ll finish the marathon in. the answer to that is pretty straight forward and gives a good opportunity to give a refresher in sports nutrition and glucose metabolism. despite running for a year and losing what i hope will be around 70 pounds on race day, thanks to my 6’4″ frame and the genetics card i was played, i will still be, er, solidly in what is known in the running world as the clydesdale class which is an endearing term for runners who weigh over 200 pounds. as a card carrying clydesdale, i burn a lot of calories when i’m running. how many? if i run 10 minute miles ( 6 miles per hour ), i burn around 1100 calories per hour. the problem is that even if i carbo load before a long run, i’m only going to have about 2,000 calories in stored glycogen in the “gas tank”. once that gas in the tank is used up, you hit the dreaded “wall”. you’re done. kaput. obviously, if that was all i had, then i could only run for 2 hours or about 12 miles. i can and will take in as many calories as i can while running, but an endurance runner can only take in and absorb about 275 calories per hour. 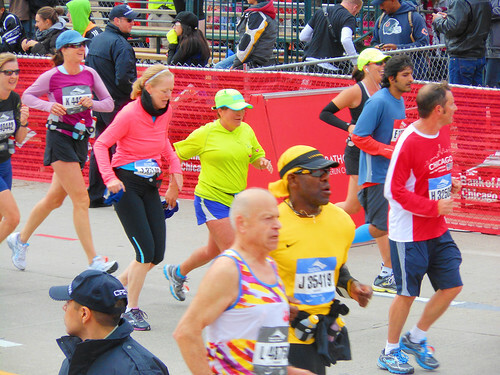 try to take in any more than that and you’re going to run into, uh, gastrointestinal problems and bring on a case of the runner’s trots ( or worse ). so, i’m burning 1,100 calories an hour at 6 miles per hour, which is a 4:20 marathon race time, and i can take in about 275 calories an hour which nets about an 825 calorie burn rate. good deal! i can burn some fat! surely i have enough fat to burn! ah, but at moderate levels of physical activity you can only get about 50% of your calories from fat ( and you still need glucose around to burn that fat, once the glucose is gone you lose the ability to efficiently utilize either source of fuel ). so, i need about 800 calories per hour and i can get 400 of those from fat which means i’m going to drain the glycogen tank at the rate of 400 calories per hour. if i have 2,000 calories in the glycogen tank that means i can run for 5 hours. awesome! if run at 6 miles per hour or a 4:20 marathon race time, all the math works out in my favor! but what if i want to push it and run an unadjusted paul ryan race time of 4 hours? well, then i burn a little more calories, or about 1,200 per hour. after i take in 275 an hour in “goo” and sports drinks and whatnot i’m netting 925 calories per hour. here’s the kicker, the additional exertion decreases the efficiency of fat burning and i can then only get about 40% of my calories from fat which means i’m burning 555 calories an hour from the 2,000 calorie glycogen tank which means i run out of gas in about 3.6 hours. or about 30 minutes before i theoretically finish in 4 hours. which is a long way of saying, if everything goes well, i can probably run a 4:15-4:30 marathon without risking running out of gas and hobbling towards the finish line. 18 miles! 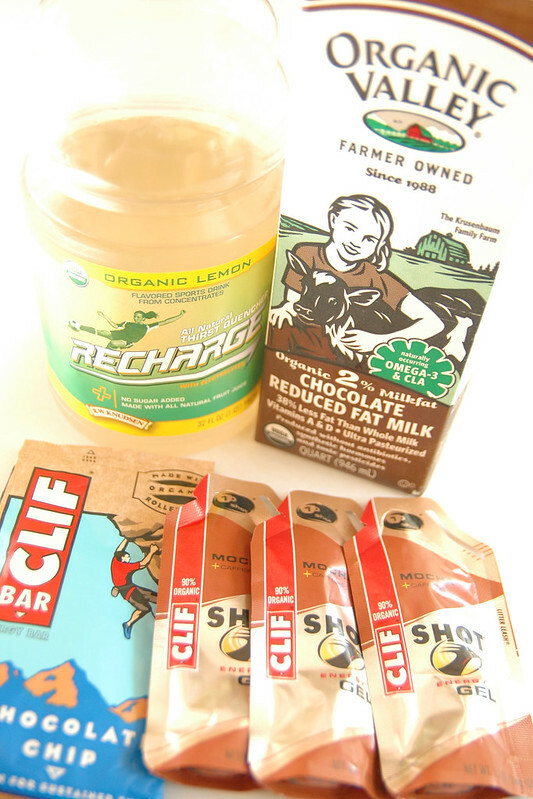 and what to eat and not eat before a long run. it’s just 5 weeks until the chicago marathon which means i just have a few more long runs before tapering down on the last 3 weeks before the race. my last three long runs have been 16 milers. i posted about one here and the rest i ran on vacation in maine. i’ll possibly maybe get around to posting about them if i have time. generally speaking they’ve gone alright for LSD ( long slow distance ) runs where the goal is to just make it through the run at about a mile or two per hour pace slower than your 10K speed ( usually when i get in trouble it’s because i try to outpace my LSD speed and start to run out of gas ). 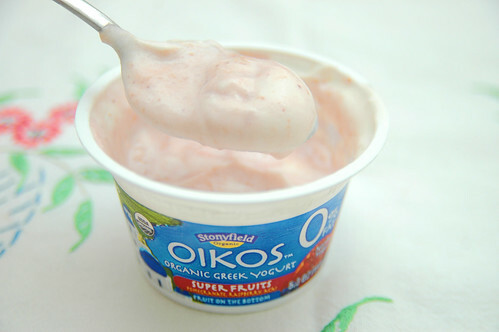 so today was my 18 miler and i started it with my usual, favorite pre-run food, stonyfield oikos organic greek yogurt. it makes for a great post run snack but i’ve also found the extra protein and modest carbs make for an awesome, easily digestable pre-run snack that keeps giving the gift of energy along the way ( in addition to a mocha clif shot for longer runs ). that’s all well and fine and the first 12 miles felt excellent, but then the gas ran out of the tank and the last 6 miles were a tortuous reminder why having a dinner of more than a couple of beers and pretzels ( and nothing else! ) is not a way to get prepared for longer long runs. one or two beers is fine as long as they’re not consumed on an emtpy stomach. 3 or 4 not so good. especially when only chased with pretzels.